Mission San Juan Capistrano. Courtesy of Santa Barbara Mission Archive-Library. 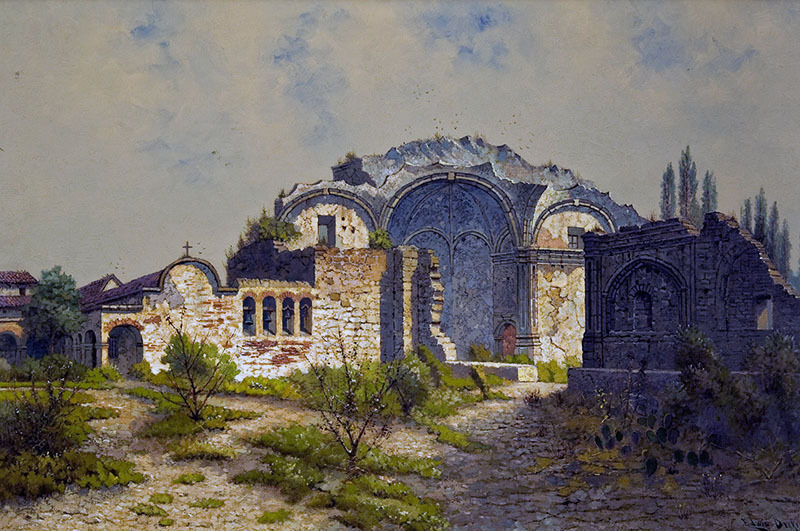 Mission San Juan Capistrano was first founded by Father Lasuén on October 30th, 1775. When just a few weeks later word spread of an Indian revolt in San Diego, the founding padres and soldiers left San Juan Capistrano to help fight. Once fighting had subsided, Father Serra personally led a party to re-found Mission San Juan Capistrano on All Saint’s Day, November 1, 1776. The mission Serra Chapel, completed in 1782, is the oldest standing building in California. It is also the only chapel still standing in which Father Serra said mass and performed baptismals. Yet, as the neophyte population grew, the small chapel could no longer accommodate them all, so construction of the Great Stone Church began in 1797. Unfortunately, it collapsed fifteen years later in the earthquake of 1812. Four bells that once hung in the Great Stone Church survived the earthquake and today hang in a bell wall that forms one of the mission’s most picturesque features. The chapel’s beautiful altar, made of cherry wood and covered with gold leaf, is from Barcelona, Spain. At the center of the altar is a statue of St. John Capistran, the 15th-century Franciscan for whom the mission is named. This side chapel is dedicated to St. Peregrine, patron saint of cancer sufferers. His legendary self-healing of the disease has led many to visit this chapel in hope of a miraculous cure. As in mission days, Capistrano continues to cultivate grapes, which are converted into wine in this wine vat. Mission San Juan Capistrano was the first mission to produce iron from ore. These Catalan furnaces helped to make locks, iron bars, and metal equipment. From its production or iron ore to its winemaking and annual migrating flock of swallows, Mission San Juan Capistrano continues to stand strong as number seven in the chain of 21. From I-5: Exit Ortega Highway and travel west. The mission is located on the corner of Ortega Highway and Camino Capistrano. 9a - 5p daily. Please call 949-234-1300 to confirm.